Daniel's Day Out was invented from an off-hand comment made during one of the F1 Debrief shows in 2011. Seeing that Paul di Resta had Paul's Performance Report, I thought that it would only be fair for the other Formula 1 rookies to have their own one-word reviews as well. Christine had mentioned the title 'Daniel's Day Out' during the podcast and that was all I needed to want to help out. I volunteered to give my input on one of my favourite F1 rookies, Daniel Ricciardo. The driver with the silent 'i' in his name had gotten my attention during the post season tests in 2010, and I thought that being able to help out with Sidepodcast in some small way would be super fun. 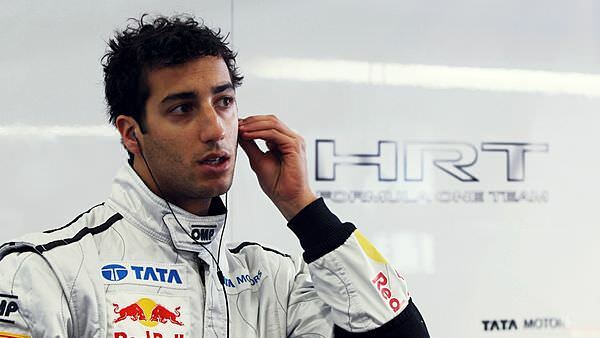 Winning the British F3 championship in 2009 and being runner up in the World Series by Renault in 2010, provided Ricciardo with a very attractive CV on his ascent to Formula 1. Combine his results in the junior categories with stellar performances in the Young Driver Rookie Tests, and the Australian driver had the proposed makings of the next young F1 super-star. Daniel’s presence in the F1 paddock in 2010/11 was a sign of intent from Marko to Scuderia Toro Rosso’s then driver line up of Sébastien Buemi and Jaime Alguersuari. Ricciardo’s participation in free practice sessions on Fridays with STR provided the Australian with valuable seat time. It also provided a constant pressure to the team’s current drivers from management to either improve their own performances, or expect immediate replacement. So although being in F1 was a ray of sunshine for Daniel, he was a huge raincloud for Sébastian and Jamie. Both of the Toro Rosso drivers were given what seemed like a small reprieve, when Red Bull signed Daniel to HRT from Round 9 onwards of the 2011 season. His appointment in the second HRT seat replaced F1-returnee Narain Karthikeyan, which was no problem as the Indian was not providing strong performances anyway. It was widely understood that Daniel had been placed into HRT in order to give the promising rookie more Formula 1 racing experience, prior to Toro Rosso making driver selections for 2012. Having no room at Toro Rosso for 2011 mid-season, and having missed winter testing, this was the best solution. Almost everyone in the F1 world saw this as a good opportunity for Ricciardo, because any positive exposure that he could generate would help solidify his positioning into a better team the following year. Therefore, the only fair comparison that could be made was between Ricciardo and his more experienced teammate, Vitantonio ‘Read the Expiration Date’ Liuzzi. Initially Ricciardo’s sole objective was to be able to stay on pace with Liuzzi during qualifying and the race. However as the season progressed, expectations were raised on Daniel to begin dominating his teammate more consistently, and start taking the fight to the Virgin Racing cars. Although Daniel was beaten by his teammate 4/6 in qualifying, he was able to take the fight back to his teammate during the race, finishing with a 7/3 advantage. A stellar season by Ricciardo, given his lack of F1 experience and compared to a teammate who is most likely past his F1 sell-by date. From a fan perspective, it was always a slight challenge to follow Daniel during the live races. Being the driver for a team who only gets television exposure when you’re being lapped, crashing, or having your car break down makes it hard for fans to get a close look at your driving. Live timing applications helped somewhat, but most of the time I just waited for the post-race debriefings to tell me how Daniel did on his day out. The words that I chose to review his season mostly reflected how I felt at the time, rather than what the team reflected in debriefs. Sometimes I was excited by Daniel’s progress, other times underwhelmed. However, I was frustrated all the time that he had such a slow car to pedal around in. I like Ricciardo, no matter how he wants you to say his name… (silly ‘i’). Daniel did well enough in the eyes of Red-Bull management to earn himself a race seat with Toro Rosso in 2012. Hopefully I’ll able to follow him more easily in the STR-7.